Tired of the usual mashed potatoes? 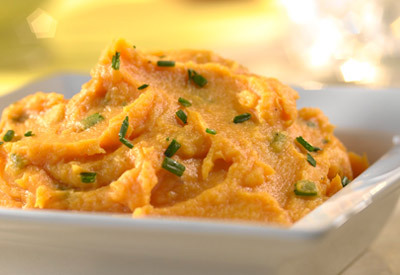 Try this fabulous puree that combines sweet potatoes and parsnips seasoned with butter, brown sugar, black pepper and chives. 1) Place the potatoes and parsnips in a 4- quart saucepan. Add water to cover. Heat over medium-high heat to a boil. Reduce the heat to low. Cover and cook for 10 minutes or until the vegetables are tender. Drain the vegetables well in a colander. 2) Place the vegetables, broth and butter into a food processor. Cover and process until the mixture is smooth. Add the brown sugar, black pepper and chopped chives. Cover and process until the mixture is just combined. Garnish with additional chives.